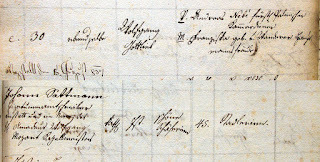 On 29 April 1835 Wolfgang Amadeus Hempel was baptised in the parish church "Zur Heiligen Dreifaltigkeit" in Vienna's Alservorstadt. The fifth child of Friedrich August Hempel, a music teacher from Pirna in Saxony, and his wife Maximiliana, née Rattay, received two remarkable names from his godfather Wolfgang Amade Nebe. Nebe, an official of the conscription office of the Vienna City Council, along with the child's father and the sacristan of the parish, confirmed with his signature that "it is the explicit desire of the [Protestant] father that this boy is to be raised catholic." e. 30 ebend[er]selbe [the priest Julius Gabelhofer] Wolfgang / Gottlieb V. [father] Andreas Nebè fürstl[ich] Palmischer / Kammerdiener M. [mother] Franziska geb. v. Wanderer Haupt / manns fräule [godfather] Johann Sattmann / Vizetumamtschreiber/ anstatt und im Nam[en] des / H[errn] Amadeus Wolfgang / Mozart Kapellmeisters kath[olisch] J[oseph]st.[adt] schöne Schäferin 45. [midwife] Stadlerinn. The discovery of Mozart as godfather resembles an unknown room that suddenly opens in Mozart's life. The godchild's father, Andreas Nebe (b. 1741 in Hettstedt in Saxony, d. 23 February 1811 in Vienna), was a chamberlain of Count Karl Joseph von Palm-Gundelfingen (1749-1814) who must have made Mozart's acquaintance at the Count's palace. Palm-Gundelfingen was a great lover of music and also was one of the subscribers of Mozart's 1784 concerts in the Trattnerhof. The baptism took place on 30 May 1787 in the Piarist Church of Maria Treu (of Anton Bruckner fame), the parish church of the Josephstadt. Mozart could not be present which may have been caused by the fact that on this very day he received word of his father's death on 28 May 1787. 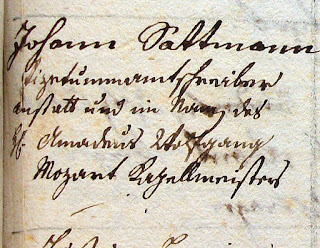 Therefore he was substituted by the state official Johann Sattmann (1745-1800), a friend of Nebe or Mozart or both (see the picture above, the key passage in the baptismal entry reading: "anstatt und im Nam[en] des H[errn] Amadeus Wolfgang Mozart Kapellmeisters"). Sattmann was a close friend of the Fröhlich family. His daughter Anna was a singer who in 1803/04 took part in several concerts at the Augarten and in 1804 was hired by Domenico Guardasoni to the Prague Opera. In 1805, in Prague, she married the singer Christian Wilhelm Häser. The only person present at the christening of Wolfgang Amade Nebe, who could actually be linked to Mozart, was the midwife Sophia Stadler (1724-1790), the mother of the two legendary clarinet players Anton and Johann Stadler. Wolfgang Amade Nebe attended the Piaristengymnasium (where he must have met Karl Thomas Mozart who also attended this school) and in 1807 became an unpaid employee of the conscription office of the Vienna City Council (which was responsible for keeping track of the male populace that was liable to military service). In 1813 he was appointed a definite employee at this office and on 25 November 1813 took the oath as "Wiener Bürger" (Viennese Citizen). One year after the death of his mother in 1836, Nebe married Anna Dander, née Bartl (1783-1865), the widow of the Tyrolian chestnut vendor Jacob Dander (1781-1831). Perhaps owing to his famous godfather Wolfgang Amade Nebe thought highly of himself and occasionally pretended to have a social status that he did not have. His self-esteem sometimes bordered on fraud. 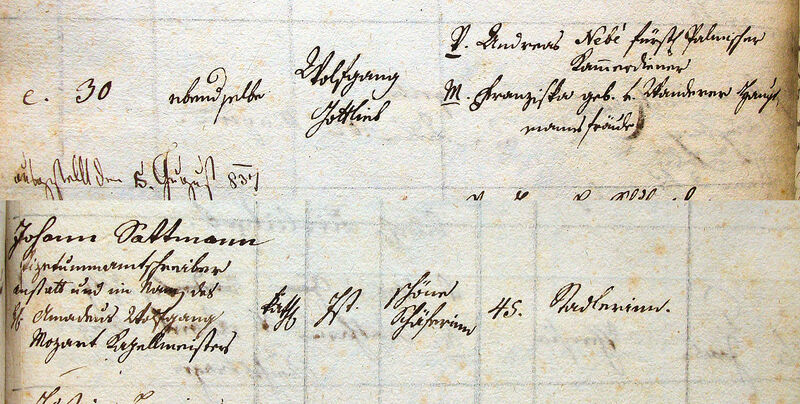 In his marriage contract he described himself as "Ehren Bürger" (honorary citizen) of Vienna, a status he did not possess; his illiterate wife probably believed it and she certainly also believed him when on the occasion of their wedding he told her that he owned assets worth 2,400 Gulden and that his father had been a "doctor of medicine." But there is more. 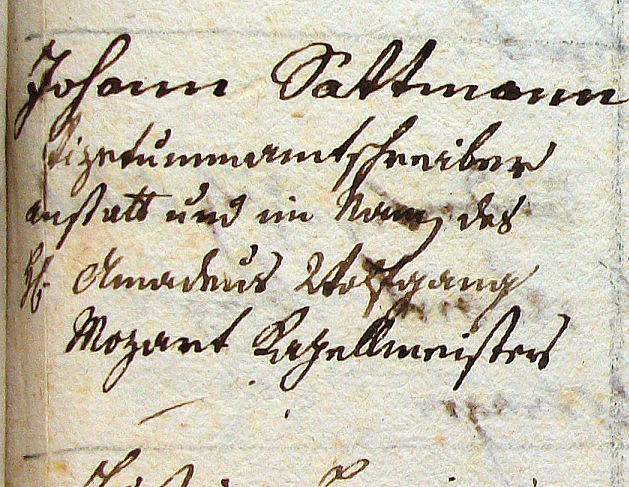 On 6 April 1814 Nebe stood godfather to a daughter of his friend Joseph Illichmann in the parish church of Alservorstadt and in the baptismal record he put the flamboyant (and pretentious) signature: "Wolfgangus Amade edl[er] V[on] Nebe Mpa". When Wolfgang Amade Nebe died on 11 June 1839 at his home in Breitenfeld No. 15 (today Laudongasse 40), of abdominal dropsy, his supposed assets turned out to be fictitious. His widow, Anna Nebe, drew her widow's pension for 26 more years. She died at 82, of old age, on 12 November 1865. How could Mozart's godfatherhood have remained undetected for so long? From my decade-long experience investigating the great composers of the Viennese classical era in the Vienna's church records I draw the following conclusion: musicians (even if they had a permanent position) were not valued among professional colleagues as godparents. People preferred aristocrats, civil servants, artisans and citizens with a secure income. For example, none of the godparents of Johann Georg Albrechtsberger's 15 children was a musician. Of course, prominent musicians appear in the Vienna church books, particularly Antonio Salieri, who as Hofkapellmeister was an enthusiastic godfather and witness, or Joseph Haydn (of whom I have so far been able to identify nine previously unknown godchildren). But it is obvious that Mozart avoided familial responsibilities of this kind, and his absence as a godparent to the children of composers and musicians who were his friends, seems to suggest a definitive reluctance. In this he showed almost the same intentional reticence as Ludwig van Beethoven and Franz Schubert. This discovery was first published in the article "Mozarts Patenkind", in Acta Mozartiana 58, vol. 1 (June 2011), 57-70.